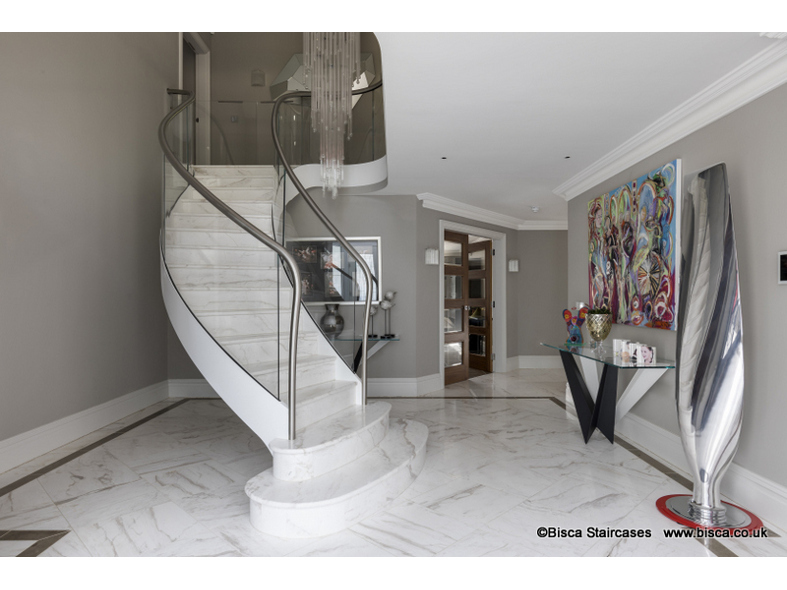 Our brief was to design a modern stone staircase for a property in Brighton. The clients also had a dog and wanted a glass dog gate as part of the design. They were also happy to discover that Bisca were willing to use the exact materials they had picked out and incorporate them into their design. 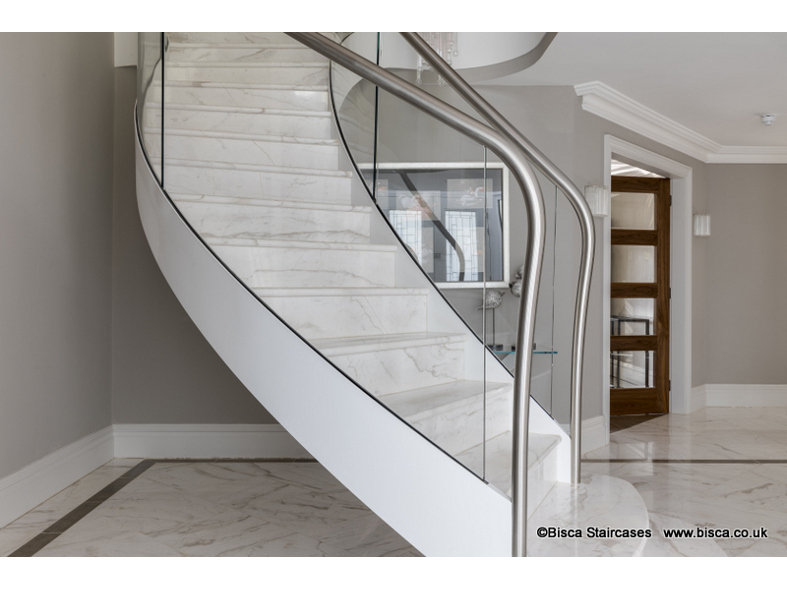 The helical design has two flared treads at the foot, creating a feature as you enter the property. Twin steel stringers sweep up the stair and around the landing. Bisca reconfigured existing landing edges, removing corners and protruding edges. The result is a usable stair with a grand sweep and sensible access to an adjacent door at ground floor. Low iron glass balustrades slot into the stringers, eliminating the need for visible clamps and gives an elegant clean finish on the treads. 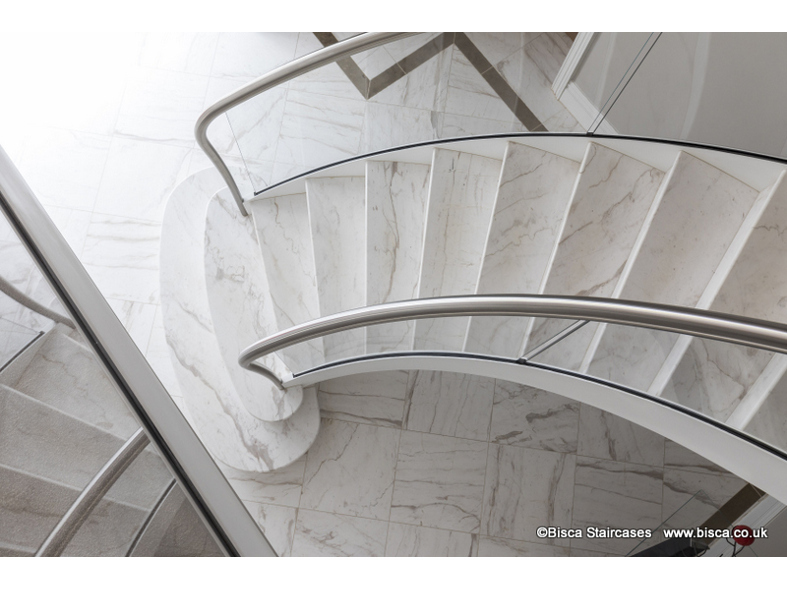 The handrail is oval stainless steel, following the curves of the balustrade and landing. The steel structure was clad in cool marble stone treads and risers, matching that of the floor. Feature newels of stainless steel end in the 3rd tread to provide greater width at the foot. At the top of the staircase, we took care to create a smooth integration with the carpet of the first floor. Also at the top of the staircase is a dog-gate. The design of the dog-gate allows the glass to fold completely back when not in use, thus reducing its visibility. The dog-gate can also be completely removed if no longer required. Dog-gates are available as part of a staircase or balustrade design, not as a stand-alone item. For more information on this project, please mention 5267. 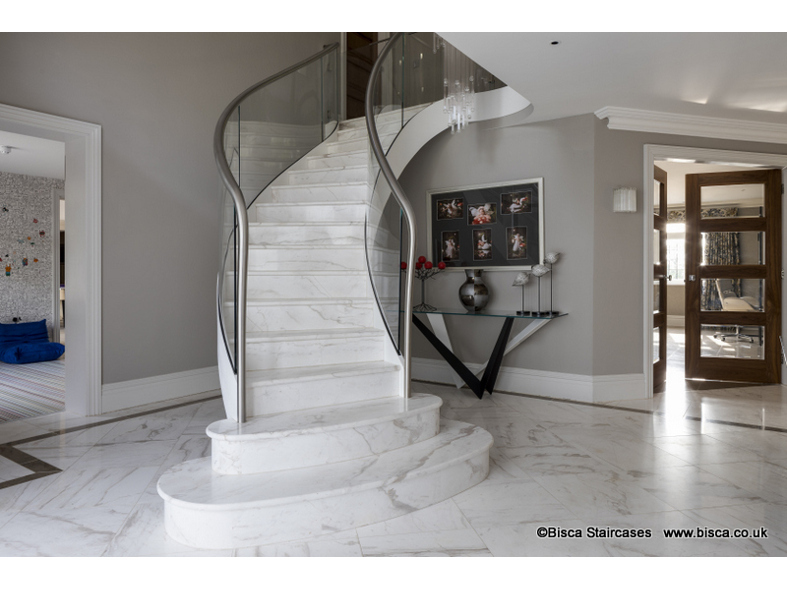 Every staircase design by Bisca is unique and designed specifically for a client and their property. Bisca commissions are truly bespoke. The starting point for our designers is a blank page and your brief. 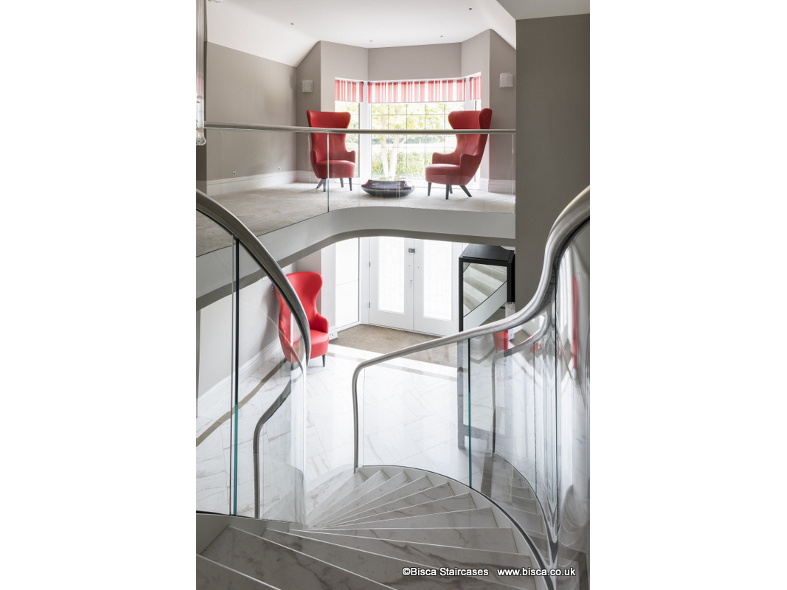 We can give you all the advice you require for your client’s staircase whether it is a new build or a staircase renovation. We will meet with yourself, and your client if you wish, and together discuss plans for the property, including style, materials, aesthetics and functional considerations.